For other ships with the same name, see HMS Alert. HMS Alert was a 17-gun wooden screw sloop of the Cruizer class of the Royal Navy, launched in 1856 and broken up in 1894. It was the eleventh ship of the Royal Navy to bear the name (or a variant of it), and was noted for her Arctic exploration work; in 1876 it reached a record latitude of 82° North. Alert briefly served with the US Navy, and ended her career with the Canadian Marine Service as a lighthouse tender and buoy ship. The wooden sloops of the Cruizer class were designed under the direction of Lord John Hay, and after his "Committee of Reference" was disbanded, their construction was supervised by the new Surveyor of the Navy, Sir Baldwin Walker. Ordered together with her co-ship Falcon on 2 April 1853, Alert was laid down at the Royal Dockyard, Pembroke in January 1855. It was fitted at Chatham with a two-cylinder horizontal single-expansion steam engine, which was supplied by Ravenhill & Salkeld at a cost of £6,052 and generated an indicated horsepower of 383 hp (286 kW); driving a single screw, this gave a maximum speed of 8.8 knots (16.3 km/h). The class was given a barque-rig sail plan. All the ships of the class were provided with one 32-pounder (56 cwt) long gun on a pivot mount and sixteen 32-pounder (32 cwt) carriage guns in a broadside arrangement. When converted for Arctic exploration in 1874, her armament was reduced to a token outfit of four Armstrong breech-loaders. Alert spent the first 11 years of her life on the Pacific Station, based at Esquimalt at the southern tip of Vancouver Island, Canada. Alert Bay, British Columbia is named after the ship, and nearby Pearse Island, at the north entrance to Johnstone Strait, is named after Commander William Alfred Rumbulow Pearse, her commanding officer. During this period it returned to Plymouth between October 1861 and May 1863 for a refit. Her service on the Pacific station was the type of work for which her class had been designed—the policing of Britain's far-flung maritime empire. The 'Alert' Taken! – On Wednesday, H.M.S. Alert was taken without resistance on the part of her officers and crew, who are believed to have lent themselves to the plot. The ship was lying at anchor in Esquimalt harbour when the affair occurred, and the time chosen by the enemy was noon-day. The captor was Mr. Robinson the Photographer, and the only weapons he used in effecting his object were a Camera, and a bit of glass. Alert paid off at Plymouth on 30 May 1868 and was placed in the Steam Reserve. In 1874, Alert was taken in hand for conversion to the role of Arctic exploration. Her single-expansion engine was replaced with an R & W Hawthorn compound-expansion engine, it was reboilered to 60 pounds per square inch (410 kPa), her armament was reduced to four guns and her hull was strengthened with felt-covered iron. Above the waterline it was sheathed with teak, and below it, Canadian elm and pitch-pine. The modifications caused her displacement to increase to 1,240 tons. 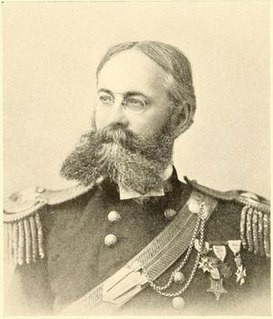 The British Arctic Expedition was commanded by Captain George Strong Nares, and comprised Alert (Captain Nares) and Discovery (Captain Henry Frederick Stephenson). The expedition aimed to reach the North Pole via Smith Sound, the sea passage between Greenland and Canada's northernmost island, Ellesmere Island. Contemporary geographers proposed that there could be an Open Polar Sea, and that if the thick layer of ice surrounding it were overcome, access to the North Pole by sea might be possible. Ever since Edward Augustus Inglefield had penetrated Smith Sound in 1852, it had been a likely route to the North. Despite finding heavier-than-expected ice, the expedition pressed on. Leaving Discovery to winter at Lady Franklin Bay, Alert pressed on a further 50 nautical miles (93 km; 58 mi) through the Robeson Channel, establishing her winter quarters at Floeberg Beach. Spring 1876 saw considerable activity by sledge, charting the coasts of Ellesmere Island and Greenland, but scurvy had begun to take hold, with Alert suffering the greatest burden. On 3 April the second-in-command of Alert, Albert Hastings Markham, took a party north to attempt the Pole. By 11 May, having made slow progress, they reached their greatest latitude at 83° 20' 26"N. Suffering from snow blindness, scurvy and exhaustion, they turned back. The expedition was rewarded on its return; Nares was knighted, Markham was promoted to captain. 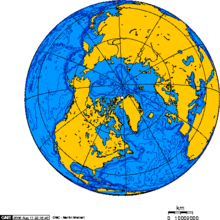 The geography of northern Canada and Greenland is dotted with the names of those connected with the expedition: Nares Strait, Nares Lake, Markham Ice Shelf, Ayles Ice Shelf, and Mount Ayles. The northernmost permanently inhabited place on earth, the settlement of Alert at the northern point of Ellesmere Island, was named for the ship. Alert recommissioned at Chatham on 20 August 1878 under the command of Captain Sir George Strong Nares for a survey of the Strait of Magellan. On 12 March 1879 Captain John Fiot Lee Pearse Maclear took command, and under him she went to Australia Station and the Pacific. She was employed in surveying, but the presence of Doctor Richard Coppinger, her surgeon, ensured that she also made a huge contribution to the field of zoology. Coppinger, who had also served in the Arctic expedition, was an accomplished naturalist and his collections from the period 1878–1882, which included indigenous cultural artifacts purloined, as he admitted, from Mutumui sites on Clack Island, added 1,300 species to the National Collection. Alert paid off at Sheerness on 20 September 1882. Adolphus Greely led the Lady Franklin Bay Expedition to the Arctic in 1881. Two supply ships failed to reach his party, and a relief expedition in 1883 also failed to extract the team. The US Navy put together a further relief expedition in 1884 under Captain W. S. Schley, and Alert was offered. She was loaned to the US Navy under the command of Captain George W Coffin on 20 February 1884, and was used to set up supply dumps to support USS Bear in the extrication of Greely and his men. Two members of Greely's expedition, Lieutenant James B. Lockwood and Sergeant David Legge Brainard had achieved a new record of 83° 30'N, just 4 miles (6.4 km) closer to the Pole than Markham had achieved in 1876. Lockwood and 19 other members of the expedition died; Greely, Brainard and four others survived. In September 1880, the United Kingdom transferred its rights of Arctic sovereignty to Canada. From 1884 to 1886 the Canadian Marine Service of the Department of Marine and Fisheries sent an expedition to Hudson Bay to establish observation posts and to estimate the length of season for ice-free navigation. A former lieutenant of the Royal Navy, Andrew Robertson Gordon, was placed in command, and a suitable ship was sought. Having finished her work with the US Navy, Alert seemed the ideal vessel for the task. She was sailed to the Royal Naval Dockyard, Halifax and transferred by the senior naval officer to the marine agent of the Department of Marine and Fisheries. The Alert was a screw steamship, barque rigged, of about 700 tons gross . . . constructed as to be capable of resisting great ice pressure, and her engines being only 50 nominal horsepower, the screw is small . . . so that in every way she was well adapted for the work of the expedition. In 1886 she carried Captain Markham, who had been second-in-command of Alert during the 1876 Arctic Exploration, and now represented the interests of a railway company interested in building a line from Winnipeg to Hudson Bay. Captain Markham left the ship at York Factory, Manitoba and returned by the Hayes River canoe route. After the last Hudson Bay expedition in 1886, Alert was reconfigured as a light-house supply vessel and buoy tender. Her topmasts and yards were removed, and a wheelhouse was built abaft the remains of the main mast. She worked at first in Nova Scotia, but as her wooden hull showed signs of deterioration, she was moved to the Gulf of Saint Lawrence, sailing out of Quebec. Thirty years after her launch little was left of her original appearance; in essence she was now a small, old, low-powered steamer showing the scars of hard labour and many an ungainly conversion. Nevertheless, she continued to give useful service until the last decade of the nineteenth century. CGS Alert was laid up in November 1894 and sold, the bill of exchange being forwarded to the Admiralty, since she was still officially on loan, the total sum being 814 pounds, 2 shillings and 7 pence. The ship was probably broken up at an undisclosed location. CFS Alert, a Canadian military listening post, Alert, Nunavut the world's northernmost continuously inhabited settlement, and Alert Bay, British Columbia, are named after the ship. ^ "HMS Alert at Naval Database website". Retrieved 17 November 2008. ^ a b c d e f g h i "HMS Alert at the Canadian Coastguard website". Retrieved 16 November 2008. ^ a b c d e f "HMS Alert at William Loney website". Retrieved 16 November 2008. ^ Walbran, John (1909). British Columbia Coast Names, 1592–1906: their origin and history. Ottawa. ^ "George Robinson, Vancouver Island Pioneer". Retrieved 20 November 2008. ^ a b c "1875–76 Arctic Expedition at Richard Cavill's website". Retrieved 22 November 2008. ^ "Biography of Albert Markham at the National Maritime Museum". Archived from the original on 9 June 2011. Retrieved 19 November 2008. ^ "Biography of Dr Richard William Coppinger at the National Herbarium Nederland (English Language)". Retrieved 26 November 2008. ^ Coppinger, Richard William (1899). Cruise of the "Alert" (3rd ed.). London: Swan Sonneschein & Co.
^ "The Arctic Saga of David Legg Brainard at Pahlbooks.com". Archived from the original on 19 November 2008. Retrieved 26 November 2008. ^ "The Arctic and Hudson Bay at the Canadian Coastguard website". Retrieved 18 November 2008. ^ "USQUE AD MARE – The Alert – Canadian Coast Guard". Ccg-gcc.gc.ca. 5 October 2011. Retrieved 26 September 2012. ^ Winfield & Lyon 2004, p. 434. Vice-Admiral Sir George Strong Nares was a Royal Navy officer and Arctic explorer. He commanded the first ship to pass through the Suez Canal, the Challenger Expedition, and the British Arctic Expedition. He was highly thought of as a leader and scientific explorer. In later life he worked for the Board of Trade and as Acting Conservator of the River Mersey. Mount Ayles is a mountain located on Ellesmere Island, Nunavut, Canada. It forms part of the border of the Quttinirpaaq National Park. Like the nearby Ayles Ice Shelf, the mountain was named by the Geological Survey of Canada in 1965 for Petty Officer Adam Ayles of HMS Alert, who was serving in the British Arctic Expedition under George Nares. Pim Island is located off the eastern coast of Ellesmere Island, part of the Qikiqtaaluk Region of the Canadian territory of Nunavut. Located within the Canadian Arctic Archipelago, it is a part of the Queen Elizabeth Islands. The Cruizer class was a class of six 17-gun wooden screw sloops built for the Royal Navy between 1852 and 1856.